"Two Enemies ... The Mob ... The Ultimate Showdown." 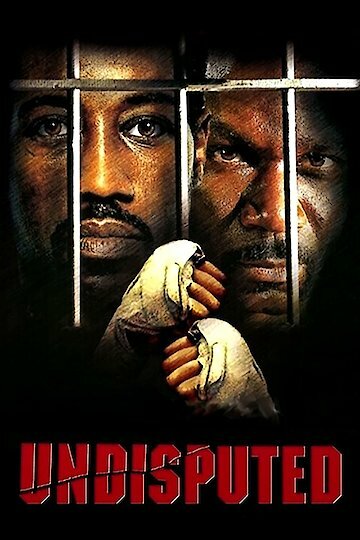 Undisputed is an action movie that made its debut in 2002. This movie stars Ving Rhames and Wesley Snipes. This movie is about a man who is a career fighter, and finds himself in prison. This career fighter will face off with another retired career fighter, for the chance to win the undisputed fighting title. Ving Rhames, is a currently paid fighter with a history of never loosing. His character has a history with having a bad attitude with everyone he comes in contact with. He is a womanizer who thinks that he can beat everyone in jail. This hot tempered man will find his ultimate match. His fighting opponent which will be, Wesley Snipe's, will give Ving a fight he won't ever forget. Snipes' character is quiet, he keeps to himself, he is smart, meticulous, and observant. Wesley, who was a great fighter in his day, has put down the gloves and now makes intricate objects out of toothpicks. He observes Ving and his bad attitude throughout the movie. Although Wesley is not impressed, Rhames wants to prove his greatness to the inmates. Both men will train and prepare for the fight inside their jail cells. Inmates will make and take their final bets before the two men enter the ring. Almost anything goes in the ring, which includes cheating the other opponent. This fight will take ever ounce of energy the men have. These two men duke it out until a proven winner is revealed. Since this fight was not made for public consumption, people on the outside were unaware of this jailhouse rumble. Only the fighters and the inmates will know who the prison champion really is. When the fight is finished, the fighters will show mutual respect for each other. Undisputed is currently available to watch and stream, download, buy on demand at Hulu, Amazon, Vudu, Google Play, iTunes, YouTube VOD online.